The Cabot Farmers' Legacy Collection honors the European roots of our farmers' ancestors. Distinctive from our traditional, award-winning sharp cheddars, this collection marries sharpness only obtained by natural aging plus hints of their countries of origin. 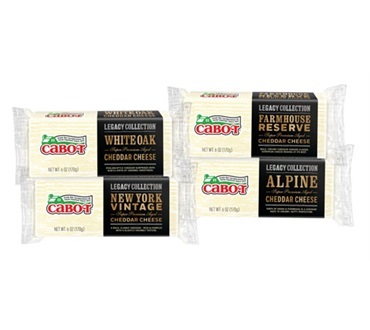 We've selected 4 flavor profiles Farmhouse Reserve, White Oak Cheddar, Alpine Blend and New York Vintage each with a unique taste proudly presented by the 1,200 farm families who own Cabot. FARMHOUSE RESERVE, 6 oz bar - A bold and creamy Extra Sharp with a Northeast Bite! Lush, richness in a mellow, well-defined, slightly crumbly body. Balanced flawlessly, this artisanal-grade cheddar whispers with subtleties that are evocative of our farmers' valley fields. As in the best cheddars, classic sharp notes linger appealingly. ALPINE CHEDDAR, 6 oz. bar - A creamy, subtle Swiss and Italian Alpine Cheddar with a slight "grana" texture similar to Parmesan. At room temperature, this cheese will surprise and delight even the most jaded cheese aficionados with its unique flavor. We hope you will find its characteristics at once familiar and completely unique. WHITE OAK CHEDDAR, 6 oz. bar - Inspired by the award-winning Cabot Clothbound. Subtle caramel sweetness with delicate hints of the duskiness of wine aging casks. Traditional only if you know the best of British cheddars, honoring balance, sharpness and a smooth milky texture. Crafted similarly to Cabot's 2013 American Cheese Society Winner, Clothbound Cheddar, without the cave aging process. NEW YORK VINTAGE, 6 oz. bar - A new addition to our Legacy Collection. As big and bold as New York, this classic cheddar boasts a complex, layered sharpness. Crisp taste and crumbly texture combine to perfection in this bold, sharp cheddar. New York Vintage has the tried and true cheddar taste of a classic, with complex undertones and a tart finish. For delicious recipes using the Cabot Legacy Collection please click on this link: Cabot Legacy Collection Recipes! And if you're planning a gathering, check out our suggestions for pairing these mouth-watering cheeses with global wine and beers. best cheddar i have bought,cannot find it at the supermarket anymore. Order this brand of cheese often as tastes really good. I first tried these cheeses in Florida and loved them. Very sad to return to Ohio to discover they were not available. Thankfully I checked online. We are lactose intolerant so its very hard to find cheese that we can eat without suffering. Cabot makes a wonderful variety of lactose free cheese.